A leaked email exchange between KFC top dogs appears to reveal that the fried chicken giant has huge plans to alter the Original Recipe chicken. 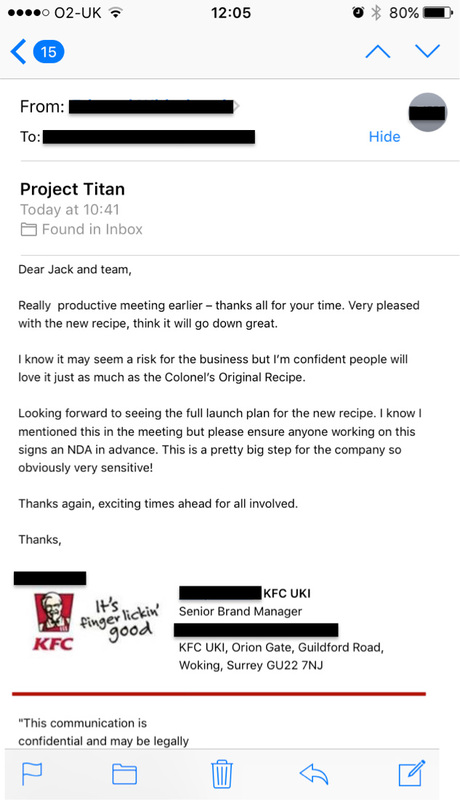 The email, which is titled ‘Project Titan’ explains how the company is taking a ‘risk’ but that ‘people will love it just as much as the Colonel’s Original Recipe’. The message gives no details of how the recipe will be changing but this is huge news since the brand has relied on Colonel’s recipe since 1940! Really productive meeting earlier – thanks for all your time. Very pleased with the new recipe, think it will go down great. I know it may seem a risk for the business but I’m confident people will love it just as much as the Colonel’s Original Recipe. Looking forward to seeing the full launch plan for the new recipe. I know I mentioned this in the meeting but please ensure anyone working on this signs an NDA [Non Disclosure Agreement – whoops] in advance. This is a pretty big step for the company so obviously very sensitive! Thanks again, exciting times ahead for all involved. We have contacted KFC for comment and they are yet to get back to us. 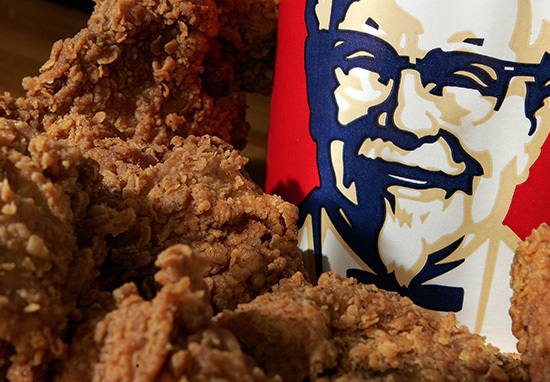 Sanders’ special ’11 herbs and spices’ has been a pillar of KFC, with many people attributing the brand’s success to the mystery of his recipe. In August 2016, a nephew by marriage of the Colonel claimed to have found a copy of the recipe on a handwritten piece of paper in a scrapbook. The recipe, which was tested and tasted ‘indistinguishable’ from the original recipe, was: two cups of flour, mixed with salt, thyme, basil, oregano, celery salt, black pepper, dried mustard, paprika, garlic salt, ground ginger, and white pepper. I know some of you may groan at the sign of change, but do not fear. KFC has saved me on many a rainy day and we trust they will make this incredible. In this transient world, you have to be a poultry pragmatist.